Common reasons for not getting job interviews include not “tailoring” your resume correctly, not applying with the right methods, having a resume that’s longer than it should be for your experience, and a number of other reasons. In fact, there are 11 common reasons why you are not getting calls for interviews, so we’ll look at all of them in this article. If you’re wondering, “why am I not getting job interviews?” then keep reading and you should be able to start getting more. While this is a good way to supplement the rest of your job search methods, it should be FAR less than 50% of your effort, and definitely not 100%. I’d recommend job boards and job sites as only 20% of your job search effort. So if you’re spending more effort than that, it’s a big reason why you’re not getting calls for job interviews. There are just too many people on here and companies get flooded with applications. 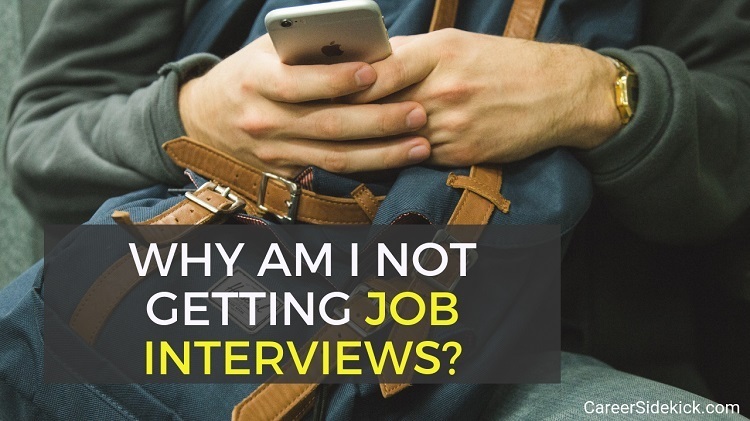 It’s difficult to stand out, it’s not personal at all, and although you can apply for a ton of jobs, it’s not very beneficial if nobody’s calling you back to interview! So what should you be doing for the other 80% of your time? I’d recommend networking to get interviews, and applying directly to companies that interest you. The next reason you might not be getting job interviews is related to your resume, specifically your employment history section. This is NOT going to impress a hiring manager or a recruiter because it’s really just telling them what work your boss assigned you to do, not what you accomplished. If you want more help with this, we have a full article on how to write awesome resume bullet points, with examples. Sending out more applications isn’t always better – the point is to get interviews, right? What’s better… sending out 20 applications and getting one interview… or sending out 10 applications and getting three interviews? This is what tailoring your resume for each job will do for you! It usually takes less time than you think once you spend 30 minutes learning how to do it to begin with! Most people just don’t want to put in the time to understand it and so they apply for a ton of jobs but get very few interviews. If you want to avoid that, read that article I linked to above and start “tailoring” your resume for the job description. In short – you want to re-order your bullet points to show the employer what’s most important to THEM. And you want to make sure to include some keywords from the job description on your resume, too. While you don’t need 100% of the job’s requirements to apply, you should have around 70-75% minimum. If you’re applying for jobs that you’re not at all qualified for, it could be part of the reason you’re not getting calls for interviews. I know this one is pretty obvious but some job seekers I’ve worked with are still doing this, so I wanted to make sure to include it here. The modern resume should be short and easy to read. While it doesn’t NEED to be one page, it should certainly be a maximum of 1-2 pages for job seekers in the first 8-10 years of their career. If you’ve been working just a few years and have a three-page resume, that’s a problem. Your resume is really a highlight reel and a sales pitch to the company showing how you can help them for their specific job. It’s not a list of everything you’ve ever done… at least not if you want to get interviews. Your paragraphs should be only a few sentences each, too. Avoid big, bulky paragraphs if you want to get your resume read! And utilize white space between paragraphs/sections. Make sure it’s all well-spaced and inviting to read. You can look at this article itself as an example. Notice how there are no huge paragraphs with 10 sentences. That makes it much easier to read and more attractive (and less likely you’ll leave after a few seconds). Here are more tips on how to make your resume stand out. I mentioned earlier that you should focus on the quality of applications, not quantity. Don’t rely on job boards, don’t mass-email your resume out without “tailoring” it. But I do see job seekers that aren’t getting interviews for the opposite reason – they’re just not applying enough. You do need to send out some volume to get interviews. That’s why job boards are okay as 20%, and why you should be applying every day if you’re in an active job search! So if you’re not getting any interviews and you’re only applying for a few jobs each week, it’s time to start putting more time and effort in. If you have a big gap in employment at or near the top of your resume, you really need to address it. You can list your employment in years instead of months in your employment history if that helps. Or you can write a cover letter to explain the circumstances of why you left your previous job, and how the issue has resolved itself (for example if you had an illness but have now recovered). You can take a LinkedIn learning course to fill the space and show employers you’ve been staying active even when not employed. You could also do consulting or freelance work, on Upwork for example. You can do one or more of these things, but make sure you’re addressing your employment gap one way or another so that it stops preventing you from getting calls for interviews. Nothing wastes spaces on a resume and shows a hiring manager you’re old-fashioned than putting an Objective. Don’t do it. They already know your objective is to obtain their position. So instead, write a great Career Summary that highlights some of your biggest accomplishments and qualifications that prove you’ll succeed in this next job! That’s how to get interviewed. You can find some great career summary examples HERE. If you have any work experience at all, it’s one of the first things recruiters and hiring managers want to see. Don’t “bury” it at the bottom of page 1. It should begin on the top half of page 1, no exceptions. Adjust your resume until that’s the case, and you’ll start getting more interviews. If you need help with resume sections and ordering those sections in general, here’s an article about what to put on your resume and in what order. Anyone who’s read this blog for a while probably knows I’m NOT a fan of a functional resume – which is a resume that separates your work history into functions or categories of work, instead of by job/date. Here’s the problem… recruiters and hiring managers want to see WHERE and WHEN you did each task that you’re listing in your employment history section. They aren’t going to value it as highly if they can’t see when you did it. So none of your experience will count for as much with a functional resume. And that could be costing you interviews. It could be the sole reason you’re not getting called to interview, in fact. So if you’re not having success with a functional resume, I’d recommend changing to a chronological employment history section where you list each job and employer. There’s a reason I put this last. Most people aren’t being discriminated against – and focusing too much on this can prevent you from focusing on the things you CAN control… like how you’re applying for jobs and what’s on your resume. But it is possible you might be facing age discrimination or another type of discrimination. The best thing you can do is keep applying. And research companies before you apply. If you’re a certain race or ethnic background and concerned about being discriminated against, look at companies’ leadership and board of directors (on LinkedIn or on their company website). This is a good way to see if they hire people with a wide range of backgrounds or not. You can do the same research for age. Look on LinkedIn and see if they seem to employ people who are 40 and 50+, or if everyone seems to be in their mid 20’s. You’ll see better results by researching and applying to companies that seem to hire people similar to you. Here’s some additional reading on avoiding age discrimination.